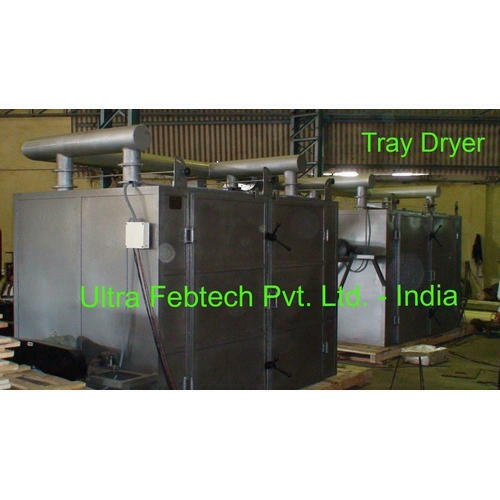 This is a batch type Rotary Tray dryer suitable for small quantities wet material. It is either in MS or SS. Trays of SS or aluminum ranging from 12 392 can be supplied according to customer's requirement. The same is either provided with steam or electrical heating arrangement. Proper insulation is given to minimize heat losses. It has also auto start and cut off facility to maintain optimum temperature in the chamber. It has two to four fans according to trays capacity. We, Ultra Febtech Private Limited from 2001 are manufacturing and exporting a high-quality range of Industrial Mixer And Blender, Industrial Siever, And Shifter. Offered products range consists of Industrial Mixer And Blender, Industrial Siever And Shifter, Material Handling Equipment, Pulse Jet Dust Collector, Industrial Mill And Pulverizer, Rotary Valve And Table Feeder and much more. In their manufacturing process, we use ultra-modern tools and machinery. The provided products are appreciated amongst our customers for their sturdy construction, reliability, exceptional performance, long service life, low maintenance, and lightweight. Sprawling over a vast area, we have developed a sophisticated infrastructure facility. We have divided our infrastructure into different departments like designing, manufacturing, quality control, packaging, sales and marketing, and many more. These departments are supervised by our professionals who are hired on the basis of their rich industry experience and knowledge. Due to our on-time delivery and easy payment option, we have been able to mark a remarkable name in the industry. Our mentor Mr. Mahendra Patel has guided us to be able to reach such heights. His ability to managerial skills and make good decisions has been our most valuable asset to grow rapidly.